Unlike normal hair that only allows necessary amounts of moisture to penetrate the scales of the outer cuticle, porous hair absorbs liquid like a sponge. DERMAdoctor explains that your hair's cuticle is made of tiny keratin scales that overlap one another. Chemical processes such as coloring, bleaching, permanent waving and relaxing can damage the cuticle, separating the scales. Correcting the situation requires the use of products that will help smooth and strengthen the cuticle. Wash your hair using a keratin-based shampoo. Squeeze a quarter-sized amount of keratin shampoo into your hand and massage it into your scalp and hair. 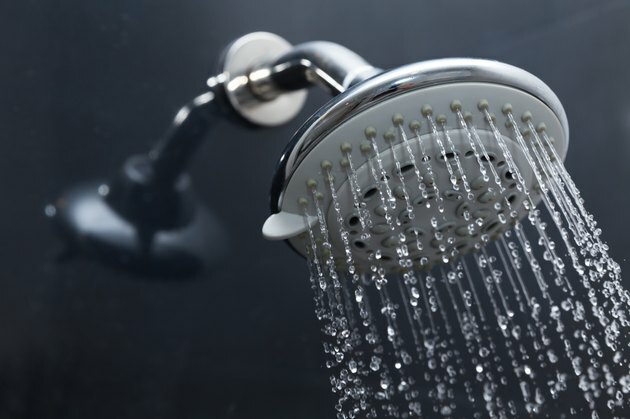 Rinse the shampoo from your hair using lukewarm water. Give your hair an acid rinse after rinsing out the shampoo. Pour ½ cup of apple cider vinegar into a disposable cup and pour it over your hair. Comb the apple cider vinegar through your hair using a wide-toothed comb. Leave the apple cider vinegar on your hair for five to 10 minutes. Remove the apple cider vinegar with a lukewarm water rinse. Moisturize your porous hair using a keratin-rich conditioner. Massage a quarter-sized amount of conditioner into your hair, comb it through to the ends using a wide-toothed comb and leave it on for three to five minutes. Rinse with lukewarm water. Blot your hair dry after washing and conditioning using an absorbent towel. Apply a dime-sized amount of leave-in conditioner to your hair, which will help with strengthening the cuticle. Style your hair as usual and rub a pea-sized amount of coconut oil over your styled hair to smooth the cuticle and add shine. Substitute lemon juice if you do not have apple cider vinegar available. Avoid washing your hair too much. Over washing can strip your hair of natural oils necessary for healthy hair. If you wash your hair every day, try switching to every other day instead. Refrain from exposing your hair to any chemical processes while correcting your porous hair. Don’t skip the acid rinse. The acidity in the apple cider vinegar will help re-strengthen the cuticle, by helping to reseal the separated keratin scales. Do not use hot water to rinse your hair. The heat will keep the cuticle open. Lukewarm water will help seal the cuticle.